In a society largely dependent on peer feedback to make purchase decisions (especially online), customer reviews are worth their proverbial weight in gold. The problem is that without a clear understanding of why people share these reviews and how to motivate them to do so, most businesses are stuck hoping their customers will “just do it.” That’s exactly why we created this guide. As the title implies, we’re about to break down exactly how to ask for a review most effectively. To be clear, while written reviews and testimonials are powerful examples of effective social proof and can have a dramatic impact on a prospective customer’s purchase decision, that’s not all we’re after in this guide. No, we want user-generated content submissions too—photos, videos, the lot. This guide will help you generate more of all of these types of content. The information contained in this guide could (and should) change the way you ask your customers for reviews to support your marketing, so pay close attention. There are three key reasons that most of your customers will be submitting their reviews and content. If you can implement tactics to appeal to all three motivations, you’ll likely be able to multiply the amount of submissions you receive several times over. Generating reviews or user content takes more time and energy than most people are willing to put forth, even if they loved your product or had an excellent experience with your business. Most people need an incentive to take the time out of their otherwise busy day. That incentive doesn’t always have to be highly valuable or even guaranteed, but in their mind it makes it worth their while to go out of their way to help your business. Learn how to properly address the “what’s in it for me?” in your customers’ minds, and they’ll go that extra mile for you. The opportunity to be featured in front of your audience is, after all, another version of an incentive, and it may be all that some people need to motivate them to submit a review or consumer-generated content. In a world where sharing a picture of your lunch or a live video of yourself at the supermarket has become the norm, an opportunity for a customer to have their review or content submission showcased in front of your audience is an exciting opportunity. 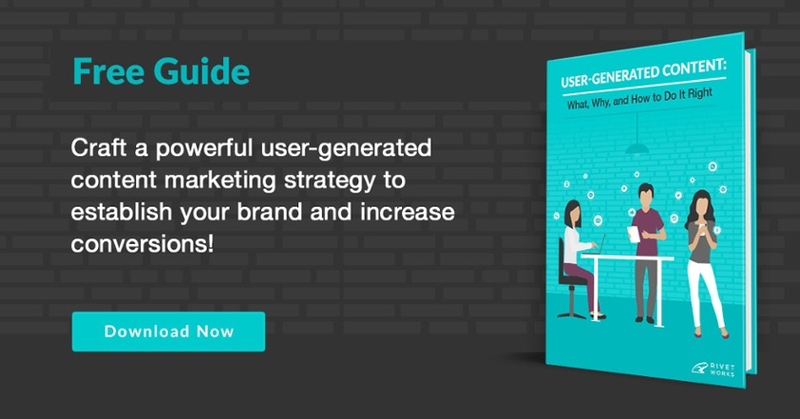 As you’ll discover in an upcoming section of this guide, there are powerful ways to use this to your advantage and generate more customer reviews and content. Today, reviews and user-generated content are highly valued assets that many businesses solicit in one way or another. However, before the customer review was a must-have marketing tool, it was an organically generated response to a positive customer experience. Now that you know why people share content, it’s time to get into the “how” of asking for a review. Below we break down the best ways to ask for a review or content based on incentives, exposure, and altruism. Incentives are often the most powerful way to capture reviews and content from your customers. The impact that including the right incentive could have on your submissions is dramatic, so it’s important to get it right. Incentives could range from a customer discount on their next purchase from your brand to a contest to win one of your most exciting products. Start with the end in mind: What are you looking to achieve by running this contest? You know you want to capture content, but consider the desired impact of the content on traffic, engagement, sales, or any other metrics that may be important to your organization. Incentives should support your brand, and be valued at approximately the average order value for your store. Outline the contest parameters: Choose your target audience, and decide what type of content and data is relevant to capture from these entrants. Also decide what your criteria will be for a winning entry, to make sure that you are framing the prompts properly. Optimize your campaign for search: Make sure to include relevant keywords and provide social sharing buttons so that customers can easily share the experience with their network. Promote: This is an obvious tip, but nevertheless crucial to your success. Promote via email, social media, blog posts, press releases, forum posts, paid ads, and partner outreach. Set a clearly defined time frame: Be clear about how long your incentive program or competition will run. Optimal time frames can vary, but we recommend 4-6 weeks as a starting point. Promote your entrants and winner: Promoting your winners is a great opportunity to repurpose content and set the stage for future promotions. Those who didn’t win the first time around will have a better understanding of what you’re looking for and be motivated to raise the bar for their submissions during the next contest. There’s a difference between incentivizing all of your customers to leave a review (with one of the tactics outlined above) and paying someone specifically for a review of your product or service. In fact, the Federal Trade Commission has enacted laws that specifically deal with this sort of false endorsement. Be sure to read up on the full list of rules and regulations if you plan to take part in any paid reviews or endorsements of your product. An exposure opportunity is, after all, an incentive in itself. However, it’s an incentive with little to no cost, appealing to your customers’ interest in being showcased in front of your audience. By playing up the fact that someone will be featured on your site and/or social feeds, you present them with an opportunity to get in front of a new (typically larger) audience than their own. This could be as simple as having your clothing store customers send you pictures of them wearing your outfits for a chance to be one of the product’s featured images in your online store. It could also be an exposure opportunity for aspiring enthusiasts. For example, your online art supply store could host “Fan Art Friday” where the winning submission gets a blog post written about the piece, or where the piece gets shared across your social channels. The point is that your customer’s art is exposed to a new, highly relevant audience, while your products and the potential uses for them are featured at the same time. Get clear about goals: Be sure you know what you want to achieve with your submissions. What will they be used for? How will you promote them in a way that benefits both your customers and your business? Don’t make promises: Avoid misleading copy that might make your customers think that every submission gets shared. Instead, be clear that their submission MIGHT be shared if it is chosen and that many are not. Set guidelines: However you prompt your customers to submit their content or reviews, be sure that they know what you want their submissions to look like. If you only want photos taken in natural light, say so. If you only want single paragraph reviews you can use on your product pages, make sure that’s clearly stated. The final motivation you’ll want to pursue is altruism. People who are motivated by the concern for the well-being of others will be motivated to know that their submission will be helpful. One of the key benefits to these submissions is that they don’t really cost you anything in the way of incentives or time-organizing exposure opportunities. Be specific: Help your customers understand why their reviews or content is so important. The more specific you can be about how their submission helps, the better. Be personal: Those that share content are not just helping other consumers, but the brands the love (and often times business owners) by reviewing. Work to help your customers understand the personal impact that reviews/content have. Now that you understand what motivates customers to share and how to use those motivations to your advantage, it’s time to look at the various ways you can prompt your customers to take action. Below, we cover the various forms of both online and offline prompts that have proven themselves to be most effective. Online prompts are largely free, which makes them a very cost-effective way to spread the word about incentives and even spark altruistic submissions. Even paid tactics are a great way to reach your customers in new, highly effective ways. Digital prompts like the ones below are especially effective because you can link directly to the page or tool (ahem, Rivet Works) that you’re using to collect content. The first and easiest place to ask for reviews is on your website. Including a simple text banner in your website footer or a graphic in your sidebar could help you generate plenty of submissions. Adding any incentives or the chance to be featured will boost the efficacy of these calls-to-action significantly. The thank-you page that your customers see after they purchase something from your online store is an excellent place to ask for a review or a more significant form of consumer-generated content. This is typically most effective when interacting with repeat customers who may already have experience with your products, or to prepare your customers for sharing when their product arrives. Email is one of the most effective forms of business-to-consumer communication, and it also happens to be one of the most effective prompts for content/review submissions. Consider setting up an automated email series as a part of your post-purchase customer satisfaction campaign that concludes with an email asking for a review of your product. For example, directly after a purchase is made your customers receives a thank-you email. A few days later they receive an informational guide to help them use your product most effectively. The following week you send them a tips-and-tricks email that’s full of unique and creative ways other customers are using your product. Finally, later that week (after seeing submissions from your other customers in a previous email) they receive an email asking for an honest review of their new purchase. This way you’re continuing to deliver an excellent customer experience after the sale is complete, while showing your new customer examples of what other people have submitted. Imagine how powerful that becomes when you combine it with an incentive or the chance to be featured in a prominent place on your website. This is one of the reasons we use email as one of the key prompts to support customer submissions with Rivet Works. Social media is a great place to promote your incentives, exposure opportunities, and ask for earned reviews from happy customers. It’s also the perfect platform to share your reviews and customer content to help inspire others to participate. Collecting and sharing social posts could be as simple as retweeting something nice that someone had to say about your brand. But social can be used to prompt customers for reviews in a variety of ways. Using the “Fan Art Friday” example from above, the art supply retailer could post the winning submission on all of their social channels each Friday. They may even decide to promote these submissions to new audiences, both enhancing the exposure opportunity for their customers and reaching new (relevant) audiences in a unique and creative way. Paid social ads represent a multitude of opportunities to prompt customers to submit content. Figuring out how to ask for a review on social successfully could provide you with a very powerful way to reach the right people in a new way. For example, you could retarget all of your existing customers (with their email addresses) on Facebook with ads about your incentive campaign, your exposure opportunity, or simply asking for their support. While not technically an online prompt, text marketing is typically best supported by online channels. If you’ve built your text list and are able to segment your customers from your shoppers, texting is a great way to ask for a review. Your texts, like other online prompts could link directly to the page or tool that you’re using to collect submissions. Just because you’re asking for digital feedback doesn’t mean you can’t use analog prompts. If you can figure out how to ask for a review effectively and affordably with offline prompts you’ll be able to increase your submissions considerably. If you’re already shipping your customer a package with your product inside, why not take advantage of slipping in a prompt? A simple, well-designed, attention-grabbing printed leaflet or postcard can help you capitalize on the excitement of opening a new package. Be sure to place the prompt on top of everything else so it doesn’t get overlooked or ignored. Also, don’t forget to include the instructions (make them as simple as possible) for submitting their content, as well as any incentive or exposure opportunity you’re offering. This is the perfect time to ask for a quick photo of them using your product or a simple video of their first impressions. While some direct mail is less effective than it used to be, postcards are still a great way to get the attention of people who know you (your customers). Postcards are an effective way to get people to submit content once they’ve had a chance to use your product for a while. If you’re looking for long-term reviews of your products, postcards help you to reach out well after the initial purchase, especially if your customer missed prior attempts to reach them via email. Again, remember to include clear instructions and any information about your incentive or exposure opportunity. Printed and digital displays inside stores can help prompt shoppers to take action, both while they’re still in the store and much later. Submitting a photo of themselves with using your product in exchange for a small discount can rack up plenty of useful photo content. If you want your customers to remember to submit when they get home, be sure to incentivize them in one way or another. Otherwise it’s unlikely that many will remember or take the time to submit a review after they’ve left the store. Finally, placing a call to action and submission instructions on their purchase receipt means one more place to prompt…and it’s virtually free. Every customer service interaction is an opportunity to prompt customers for content. If you’re wondering how to ask for a review during a customer service interaction, bear with us. The whole point of providing customer support is to answer questions, solve problems, and generally be as helpful as possible to provide each customer with the ultimate experience of your business. While not every customer service experience is going to end well, many more will. Once your team has taken the time to help your customer solve their problems, prompting them for a review or content is an ideal next step. This could be verbally on a service call, followed up by an email with the instructions. It could also be as simple as your in-store staff pointing out your CTAs and explaining the incentives. Riding the momentum of a positive customer service interaction is a great way to secure honest, shining reviews about a successful customer experience. Reviews and consumer-generated content are powerful tools to build trust and support your marketing. They can have a dramatic impact on a prospective customer’s purchase decision and your bottom line. Now that you have a clear vision of how to ask for reviews most effectively, it’s time to start testing what works best for your unique customers. Be sure to try various prompts based on the different motivations listed above. You may find that your customers don’t need much to get them to submit a review, or that getting any consumer-generated content takes a bold incentive. You’ll never know unless you test these tactics on your customers. Take what you learn and put your efforts behind the best performers. That way you’ll have content rolling in while your competitors are still trying to figure out how to ask for a review in the first place.